The nice dessert that comes along with the influx of quality indie game releases is that we are seeing more and more soundtracks released alongside of those games. I personally love video game music. I love it even more so when the music raises above any of my game experiences. I can’t pretend to be enough of a music aficionado to care about what format these soundtracks are released on. I just care that the soundtracks are easily available more so than if they are released on vinyl. 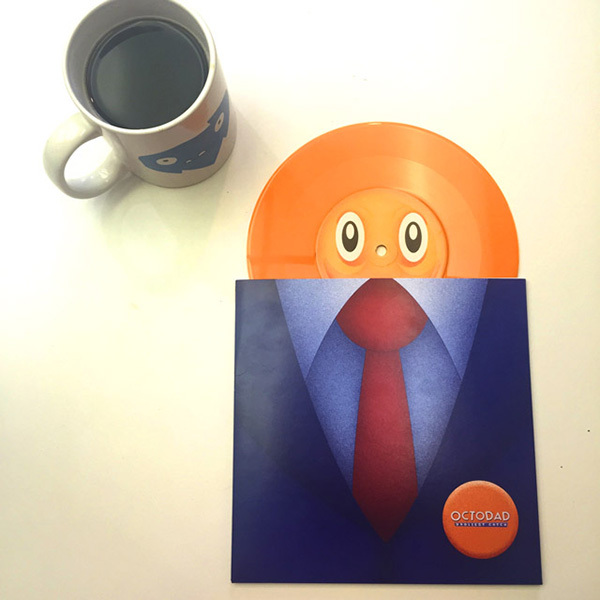 However, this 7″ Octodad: Dadliest Catch record is adorable. I appreciate adorable and I also appreciate when the format of a soundtrack ties back to its game’s roots. Normal music for a normal dad. Drew Wise designed “this totally normal album” that “will convince anyone of your normal human musical tastes!” It includes 2 tracks, Octodad (Nobody Suspects A Thing) by Ian McKinney and Scarlet’s Theme by Seth Parker. Octodad isn’t the first video game soundtrack on vinyl this year. Hotline Miami 2 also had a pretty sweet (and extensive) package. The first one to get my attention, though, was that bright green Retro City Rampage vinyl. I like where all of this is going.